The Older Americans Act established the Administration on Aging, an agency of the U.S. Department of Health and Human Services. AoA serves as the focal point and advocacy agency for older adults and their concerns at the Federal level. The Region IX office of the AoA, located in San Francisco, provides technical assistance to EOA. EOA is designated as the SUA in the State of Hawaii. 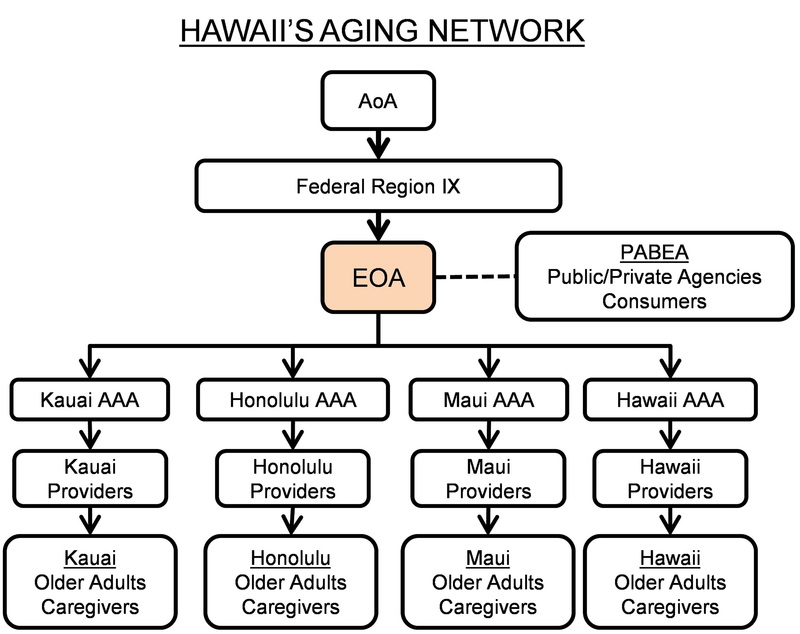 EOA serves as the lead advocate, planner, and facilitator relative to all aging and family caregiving issues in the State of Hawaii. EOA receives community input through PABEA. The PABEA membership consists of older adult consumers, service providers, and others in the field of aging. The Governor, with the consent of the State Senate, appoints all members, except ex-officio members. Ex-officio members are selected from various state departments that work closely with EOA on matters pertaining to aging and family caregiving. The majority of the membership must be age 60 or older, and at least one member must be from each county. 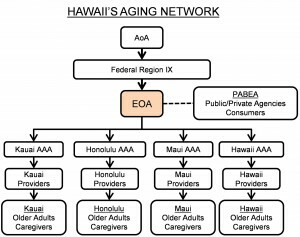 Each county in the State of Hawaii has an Area Agency on Aging. Each AAA is responsible for planning, developing, and administration of services to older adults and family caregivers residing in their distinct geographic planning and service area. Each AAA contracts with service providers in their geographic area. Services contracted include: chore services, adult day care respite, homemaker/housekeeping services, assisted transportation, legal assistance, attendant care, case management, congregate meals, personal care assistance, transportation, home-delivered meals, and family caregiver services. The federal and state funding for services is available to assist older adults and family caregivers regardless of income. However, due to limited funding, special considerations are given to those older adults and family caregivers who have the greatest economic and social needs, focusing particularly on low-income minority, limited English-speaking, and the disabled.